The new innovative Joie 360 Spin Car Seat allows allows children to travel in the recommended rearward facing position up to the age of 4 years old. Research has proven that this protects developing necks and spines up to 5 times more than forward facing. However, if your child prefers to travel in a forward facing position, this can be achieved (from 9 months). Featuring a unique 360 spin mechanism this provides a much easier way in which to place, fasten and remove your little one from their seat without straining. Complete with a compact isofix base this can be easily secured to the mounting bars within your vehicle and the multiple shock absorption layers with the support leg offers that crucial stability and security. The padded newborn insert ensures an ideal fit for smaller/younger babies and can be removed as your child grows. The headrest is height adjustable and the harness adjusts (along with the headrest) with the use of just one hand, eradicating the need for tricky re-threading every few months. 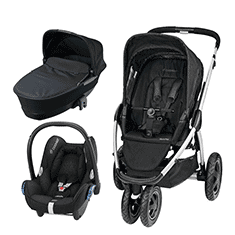 With its luxury padded cushioning and ventilated sides, this is the perfect car seat for your little bundle of joy.